Uh . . . ‘for decades’? The iPhone is only ten years old. It’s tough to take misinformed opinions seriously. That said, looks like a great update. Damn it… I was waiting for this upgrade to replace my mid-2011 i7 iMac when it unexpectedly failed and I had to buy a new i5 iMac on short notice. Happy with the new box but would have been more happy with an 8th gen unit. Are you within Apple’s grace period for returns? Maybe you can swap it. Or, sell it online and then buy the 8th gen. of your choice. I would easily take the hit on the money if this new one is so much more powerful, especially if you are thinking of the 27” model. It looks like a real winner. Of course, I just own the late iPad Pro 11.9” now and love it, but that’s all I need in my late years. But, if I were still working, I would take the loss and go for it! Punch to the wallet. LOL. 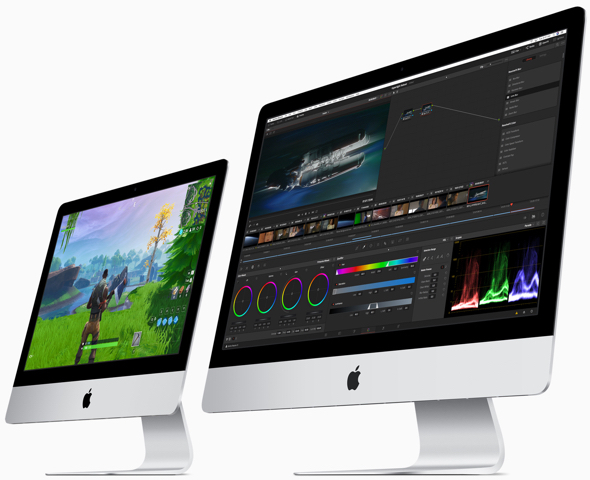 I’m glad Apple finally decided to drop in some new processing hardware like MOST computer companies do every year or so. I understand how Apple is mainly interested in iPhones (due to the revenue returns), but they still shouldn’t lose focus on desktop computers. Apple is a large enough company to stay on top of their desktop and mobile products. I’m hoping cooling/airflow was improved for the newer processors. I would think that should be a no-brainer. TINY 27″ SCREEN that isn’t a something to write home about…. My problem with the “new” iMacs is that virtually all the hardware is old. CPUs are as much as 20 or more months old. Hell, even the Bluetooth variant (4.2) is old. Even Apple has been shipping equipment with Bluetooth 5 for a long time now. Apple basically did a mild spec update on certain components and is now proclaiming these iMacs are “state of the art” while they definitely are not. “several months ago” — Would that have increased your income appreciably in the last few months, or have enabled you to make life-saving scientific discoveries that you couldn’t make on the previous machine? If not, what does it matter?